The Trumps. Love ’em or hate ’em, they make headlines around the world as much for their politics as for the ridiculous things they do (which often cross over). And while it’s normally ‘The Donald’ who has the most to say about anything, anywhere, his faithful wife, Melania, often gets in on the action, simply by being there too. She has, of course, made headlines before thanks to her questionable choice of clothing. Now, however, it wasn’t exactly Melania, but the reaction she elicited from a schoolgirl which is taking the internet by storm. As a class of 30 sixth grade students visited the White House this week, one girl stole the show by letting everyone know exactly how she felt about being there. 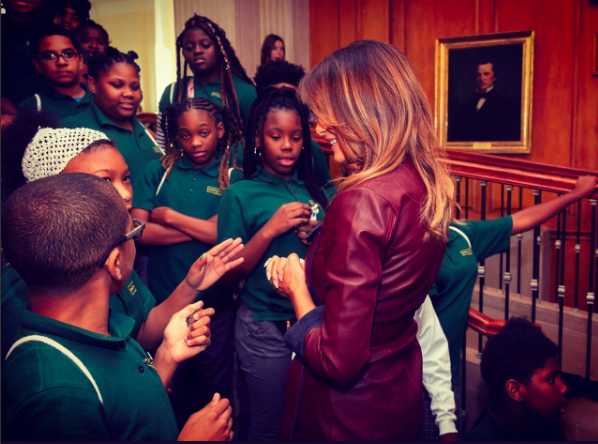 The pupils were from the Digital Pioneers Academy, a charter school in Washington DC, who got to meet Melania and the Secretary of Education, Betsy DeVos, in the White House Family Theatre, according to MailOnline. The First Lady was there to present a screening of the 2017 film Wonder, about a boy with Treacher Collins syndrome, as part of October’s National Bullying Prevention Month in the US. And while most of the kids seemed happy to be there – any field trip is better than a day at school – one girl stole the show and set the internet on fire with her defiant pose, right in front of the First Lady. Hanging back, crossing her arms and staring right down the lens of the camera with a half bored, half ‘what is this sh*t’ expression on her face, the photo quickly overshadowed Melania herself, and somehow seemed to sum up many people’s feelings toward the Trumps in general. The image was shared on Twitter by Melania herself, who thanked the students for being there and for the ‘wonderful message’ of the day. Melania’s message, however, was quickly passed over by many Twitter users, who were more interested in the brilliant pose the schoolgirl managed to pull off, without being noticed by the First Lady – before or after the tweet. Back in June this year, Melania famously wore a jacket with the slogan ‘I really don’t care, do u?’ emblazoned on the back while she was visiting immigrant children at the Texas border. It’s a jacket. There was no hidden message. After today’s important visit to Texas, I hope this isn’t what the media is going to choose to focus on. If you want to look like you don’t care Melania, you could learn a thing or two from the sixth-grader.